They've seen it all. Customer Service Rep., Gina Adams (center) has been working at the Claremore Veterans Center since it opened in June 1988. Administrative Assistant, Teresa Williams (right) started in October and Human Resources Director, Dana Campbell was hired on in December. CLAREMORE, Okla.— The Oklahoma Veterans Center in Claremore is celebrating their 30th Anniversary this week. When Claremore was chosen as the location of the new center, there was no place in the Northeastern part of the state for veterans to go for long-term care. “A lot of thought process that went into it,” said Mike Walters, the center’s first Director of Nursing. “But it was mainly the best location, center wise, for this section of the state. The Oklahoma Veterans Affairs agency paid one dollar for a 100-year lease on the property, from Rogers State University. and grind was broken on August 23, 1986. 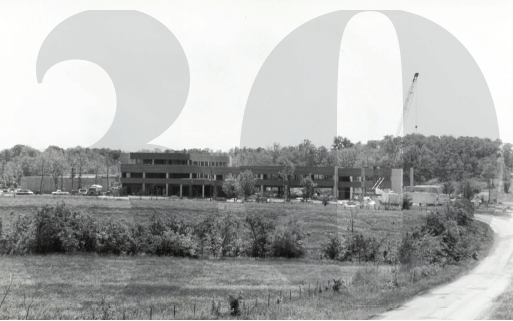 When the center opened in June 1988, they welcomed their first 75 resident veterans into the 250-bed facility. The original building was expanded to its current 302-bed size in 2002, with the opening of their 52-bed Special Needs unit. According to Administrator, Amy Hammet, they made the new unit 52-beds, because OVA Secretary, Norman Lamb, wanted Claremore to be the largest center in the state. In 1991, the center received their first accolades when the Joint Commission on Accreditation of Healthcare Organizations declared them one of the top 10 health care facilities in the nation. Through the years three women have been constants at the Claremore Veterans Center. Customer Service Rep, Gina Adams was hired when the center first opened in June 1988. Administrative Assistant, Teresa Williams was hired on to the laundry, where she worked for 12 years, in October of that year and current Human Resources Director, Dana Campbell was hired into the kitchen two months later, in December. Campbell started out working in the kitchen, under Dietary Director, Mark Hammet, of the Hammet House family. For the most part the center hasn’t seen any extreme changes. They have seen community involvement change over the years, but they still strive to keep the community involved and interacting with the residents. Every year the center and local veterans groups, like the DAV and VFW, host a barbecue, a fishing tournament, an Easter Egg hunt and trick or treating at Halloween. One constant change is the different era veterans. When the center opened in 1988, most of the residents were veterans of WW I and WW II. Currently there are 45 WW II veterans at the center, 77 are Korean War Era veterans, nearly half of the residents are Vietnam vets and there are five veterans of the 1991 Gulf War. The center’s anniversary celebration is scheduled for Thursday October 17, at 3 p.m.